The National Renewable Energy Laboratory recently published research indicating floating solar systems, commonly referred to as floatovoltaics, could make a significant contribution to electricity generation in the USA. The research identified a staggering 24,419 man-made water bodies would be suitable for floating solar arrays. This represents 27% of the number and 12% of the surface area of man-made water bodies in the United States. The report looks at a quarter of the surface area of these suitable water bodies being covered in floating solar systems. A staggering 10% of the USA current national electricity generation (which, in total, was 4,034 billion kW hours) could be generated from floating solar systems. 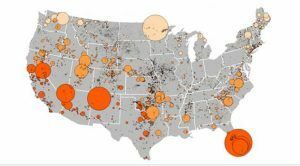 NREL rightfully points out that many of these suitable reservoirs and dams were in areas of the USA with high land acquisition costs and electricity prices, making floating solar an even better fit. As well as electricity generation, floating solar offers some additional benefits, such as inhibiting the growth of algae and reducing evaporation. The NREL team’s research has been published in the journal Environmental Science & Technology. Floatovoltaics haven’t had a huge impact in Australia, yet the future looks bright with FloatPac Solar soon to be available to the market. In April last year, NSW Energy and Utilities Minister Don Harwin said the State Government wanted to see private sector investment in renewable energy projects utilising New South Wales’ dams and other water infrastructure – however there really hasn’t been any concrete information around this plan from the NSW Minister since that time. FloatPac Solar is completing installation of our first 20kW floating solar system in mid-February in regional Victoria, with pipeline enquiries sitting at c. 8 – 9.5MW from current leads. After the validity of our system is proven and the concept is commercialised, we expect to see uptake increase significantly for floating solar in Australia. FloatPac Solar’s Australian designed floatovoltaic system focuses on decreasing the impact on the environment by containing algae bloom, enhancing water security, reducing carbon emissions, all while using 100% recyclable floating solar pods and increasing energy generation efficiency.